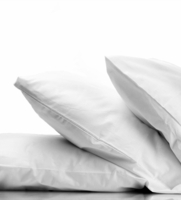 At many Hampton Inn ® Hotels it is common to see two different pillows on the bed, the Down Dreams ® Classic Firm and Down Dreams Classic Soft ®. Each pillow offers the sleeper a different support level. The Classic Soft Pillow is ideal for stomach and back sleepers, while the Classic Firm Pillow offers ample support for side sleepers. Enjoy these pillows in your own home today!